Religion and politics are never far from the headlines, but their relationship remains complex and often confusing. In this fifth edition of Religion and Politics in America, the authors offer a lively, accessible, and balanced treatment of religion in American politics. They explore the historical, cultural, and legal contexts that underlie religious political engagement while also highlighting the pragmatic and strategic political realities that religious organizations and people face. Incorporating the best and most up-to-date scholarship, the authors assess the politics of Roman Catholics; evangelical, mainline, and African American Protestants; Jews; Muslims and other conventional and not-so-conventional American religious movements. The author team also examines important subjects concerning religion and its relationship to gender, race/ethnicity, and class. 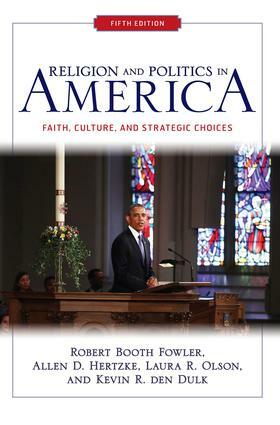 The fifth edition has been revised to include the 2012 elections, in particular Mitt Romney's candidacy and Mormonism, as well as a fuller assessment of the role of religion in President Obama's first term. In-depth treatment of core topics, contemporary case studies, and useful focus-study boxes, provides students with a real understanding of how religion and politics relate in practice and makes this fifth edition essential reading for courses in political science, religion, and sociology departments.